It’s time to celebrate with a few close friends! Mercury in Cancer, called the Lord of Abundance by Kabbalists, is pouring out its blessings in the Three of Cups tarot! The Three of Cups’ energies are speaking directly to your emotions, so everything you’re experiencing right now feels much more intense than usual. This is the energy that makes you laugh at silly jokes and cry during the sad parts of a kitschy novel. And it feels so good! No worries, you won’t make a fool out of yourself in public. Cancer Mercuries are shy and withdrawn. So your emotional outpours will happen in the safety and comfort of an intimate circle friends. 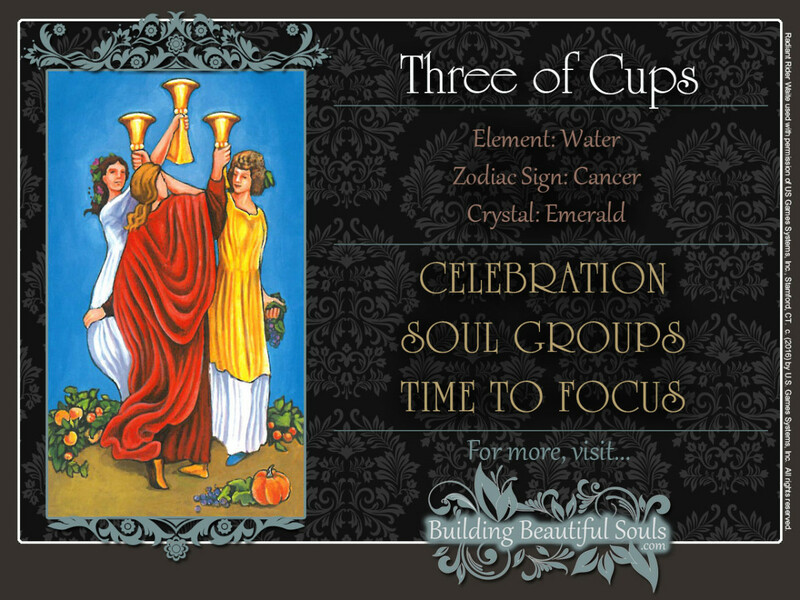 The three women in the Three of Cups dancing in this circle as they hold their cups high are having quite a grand time. Look at their smiles. Judging by the face of the woman on the right, you can tell she’s getting a bit shnuckered. And why not? Surrounded by symbols representing a rich harvest in the Three of Cups tarot, they have much to celebrate. The oranges on the ground symbolize prosperity, and orange trees may even suggest marriage. The pumpkin in the bottom right corner of the Three of Cups card signifies a rich harvest and enough wealth to pass on to your kids. Pumpkins are also associated with Halloween and therefore, this wealth is likely to be spiritual as well. The woman on the right of the Three of Cups is crowned with a wreath of grape leaves. She holds a grape cluster of grapes in one hand, and there are more grapes next to the pumpkin. Apart from symbolizing fertility and wealth, they also signify ecstasy, spiritual transformation, and uninhibited joy. The fact that in the Three of Cups the women seem to be “pledging one another,” as Arthur E. Waite puts, it adds the dimensions of close friendship. There doesn’t appear to be a leader in this trio. Their friendship is on a completely equal footing. In their joyful dance on the Three of Cups, they actually embody different aspects of the same feminine divine energy: the maiden, mother, and crone aspects of the goddess. It’s time to party like it’s 1999! And why not? It’s all right to let it hang out today. On the Three of Cups, the red and burgundy robes of the woman in the middle suggests that yes, you’ll probably overindulge! But as you can see from the white robes on the one on the left, it’s all pretty innocent. And the brown and white robes on the right woman clearly show that overall, you have your head screwed on straight. Note how the raised cups form a triangle pointing up on the Three of Cups. On the Tree of Life, this figure symbolizes the Supernal Triad. The joy you are currently feeling is divinely inspired. After all, there’s plenty to celebrate. The Three of Cups announces major accomplishments and the successful conclusion of an important stage of life. They may be in your recent past or in the near future. If you haven’t put the champagne on ice yet, what are you waiting for? Did you just sign that big contract? If not, you’re about to. Did your sweetheart bend down on one knee and present you the ring? Don’t be surprised, if he’ll do just that soon. 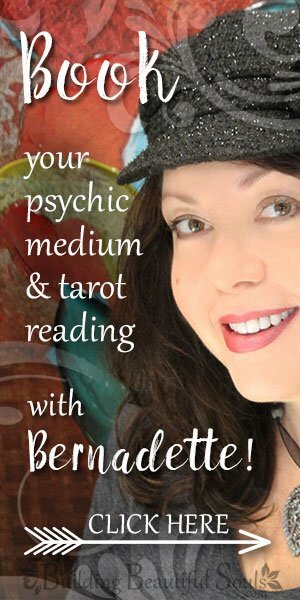 The Three of Cups tarot card spells especially good news in career and financial matters. That promotion you’ve been gunning for may well be within your reach. Your performance bonus could be bigger than you thought. Expect good news, if you’ve been looking for a job. Lifelong friendships are forming as we speak. You have met someone with whom you are feeling a sense of kinship. That shouldn’t surprise you, since you are connecting on so many levels. This is someone with whom you can laugh, cry, and paint the town red. Perhaps, you’ll even go on an exotic adventure together or start a business. Your collective energy releases tons of creativity. The possibilities are endless. When the Three of Cups card is reversed, it’s time to refocus. This can simply mean that you’ve accomplished your goal. You have celebrated a little. Now roll up your sleeves and get back to work. There are even more awesome things to do for you. The Three of Cups is like the moment after the teacher breaks up a boring lecture with a few jokes. Now that everyone has had a good laugh, he’ll jump right back into his discussion of the Pythagorean Theorem or how the Battle of Hastings influenced politics in medieval Europe. Better keep those eyes open until the end of the class. This teacher is cooler than you thought. Besides, you may actually learn something. Over time, Mercury’s bubbly and intrusive energies can be a bit much for the introverted Cancer personality. Timid Cancer likes to have his peace and quiet, while Mercury is the chattiest, most inquisitive planet you can imagine. While Cancer is still mulling over the last great revelation, Mercury is already pointing out five new, equally exciting things – bouncing around like a Chihuahua on caffeine. Either of these two energies, who by now have spent more time with one another than they should have, could apply to your situation. You may well feel overwhelmed by everything that’s happening right now. There is a powerful urge to pull the blankets over your head and sleep the day away. One “mental health” day is okay. Just don’t make it a habit. Resist the temptation to withdraw into your shell for good. The other side of the coin – Mercury’s “yappy Chihuahua” energy – is an unhealthy tendency to overindulge. If you’re partying too much, overeating, or are in a continuous search for pleasure, chances are you’re trying to fill a void in your life these things won’t be able to satisfy. Are you allowing yourself to be distracted by outside influences? True, occasional distractions add spice to your life. Just remember to keep your sights on what’s truly important. Kabbalistically, threes are associated with the female aspect of deity, the womb that gives shape to the primal creative impulse. In traditional numerology, this number is associated with Jupiter and abundance. In this card, it expresses an outpouring of joy within a close circle of friends.